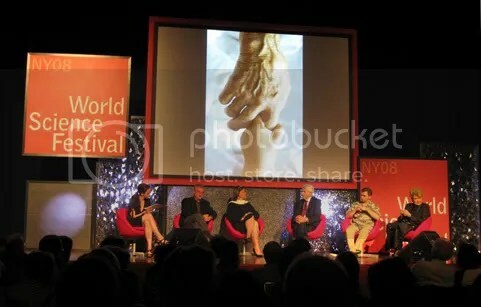 It was an exciting weekend for me as I was privileged enough to be able to attend three wonderful events at the inaugural World Science Festival in New York City. The World Science Festival, a melody of all-star speaker workshops, is trying to do for the curious minded public, what Coachella tries to do for music goers. The festival was especially appealing to me because it dealt with two areas that I am interested in; finding the reality that surrounds us from a physics perspective and being able to live long enough to see the solution. The first workshop, “Parallel Worlds, Parallel Lives: With Mark Oliver Everett,” played a BBC documentary of the same title. Mark Everett is the mathematically-challenged lead musician of the Eels, while his late father, Hugh Everett, was a world renowned physicist credited with the theory of parallel worlds. The documentary, both emotional and entertaining, trails Mark’s journey as he tries to make layman sense of parallel worlds and understand his father on a personal level. “Parallel Worlds, Parallel Lives” is set to premiere on PBS’ Nova in October. But I felt the best event was “90 is the New 50: The Science of Longevity.” It had more of a late-night talk show feel than a bunch of academics at science conference. I thought the moderator, Faith Salie, did an especially good job. The general consensus from the panelists was that in the near future (<20 years), scientific technology will advance to the point where quality life extension will happen. Harvard Medical School professor, David Sinclair, believes resveratrol, a compound found in red wine, is the key to unlocking the fountain of youth and a commerical version in the form of a pill will be available in the coming years. Sounds like good news to me! I really hope the people behind the World Science Festival would consider bring it to different cities. Most of the events were sold out and the standby lines were incredibly long. I think this was a great way to get the general public more engaged in interesting scientific issues. Next Entry: Stop the presses! Car runs on water! For reals!